Google Chrome Support Centre scam is the PUP that uses misleading techniques to prevent removal. Use Reimage to locate malicious components and get rid of them faster than with uninstall instructions. A full system scan blocks virus reappearance and prevents traffic to malicious domains. 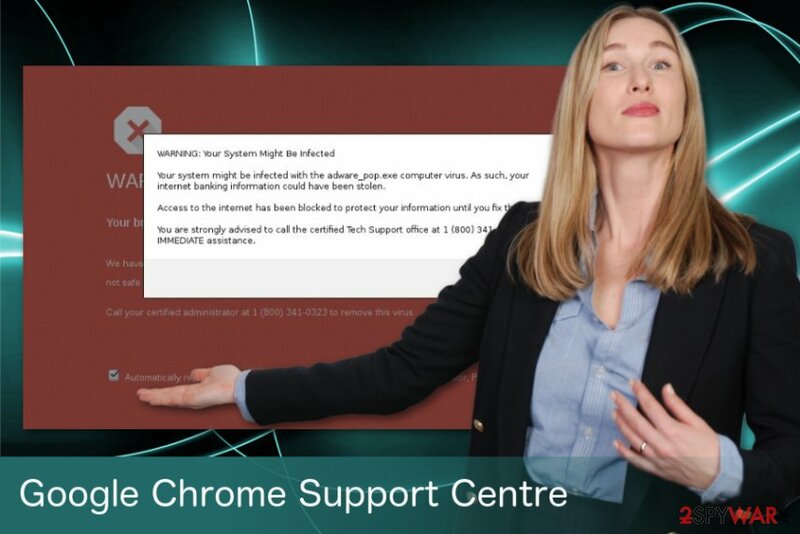 Google Chrome Support Centre is a fake warning that informs about a possible threat detected on the computer. However, it’s not a legitimate notification; it is delivered by an intrusive program – adware. This program delivers ads or similar messages in pop-up windows and causes redirect to questionable websites. Cybercriminals generate revenue by scaring people and tricking them into purchasing the suggested software or products. However, the situation might be even worse and end up with identity theft. Thus, if you encountered such website, close browser’s tab (or force quit the browser) and forget about this accident. However, if you are repeatedly being redirected to this technical support scam website, you should take care of computer’s security. In this case, you will need to remove Google Chrome Support Centre adware from the machine. security or software update pop-ups. In this case, we highly recommend opting for automatic Google Chrome Support Centre scam removal which requires scanning the computer with Reimage or another anti-malware program. It’s the quickest method to terminate this cyber parasite. However, if you want, you can try to get rid of it manually too – the guide is given at the end of the article. 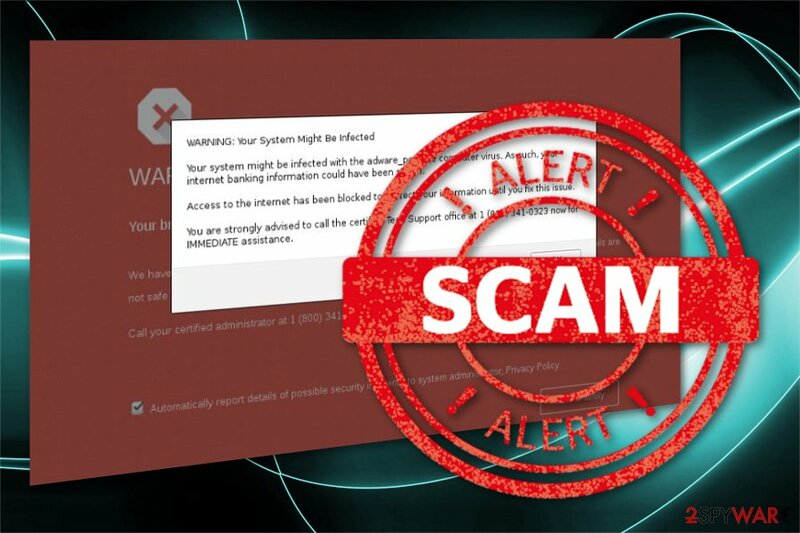 Google Chrome Support Centre scam is another technical support scam that aims at Windows computer users. When you download free programs from torrents or even legitimate websites, you might install not a single program, but a “bundle.” It means that apart from the primary program, you are also letting additional apps to enter the system. Indeed, it might sound shady, but it’s a legitimate software marketing method known as bundling. The PUP hijack might occur when you rely on Quick/Recommended setup which is not always designed to inform about additional components spreading in the same software package. Therefore, you have always to “unpack” freeware by using Advanced/Custom options. If you see suggested optional programs, de-select all of them. The best way for Google Chrome Support Centre removal is to rely on anti-malware programs. We have a few suggestions below. However, you can choose any other preferred tool, but don’t forget to update it first. Only an up-to-date software can eliminate all cyber threats. For more information, please check the instructions provided below. Here, look for Google Chrome Support Centre scam or any other recently installed suspicious programs. Wait until you see Applications folder and look for Google Chrome Support Centre scam or any other suspicious programs on it. Now right click on every of such entries and select Move to Trash. When in the new window, check Delete personal settings and select Reset again to complete Google Chrome Support Centre scam removal. Once these steps are finished, Google Chrome Support Centre scam should be removed from your Microsoft Edge browser. Here, select Google Chrome Support Centre scam and other questionable plugins. Click Remove to delete these entries. Now you will see Reset Firefox to its default state message with Reset Firefox button. Click this button for several times and complete Google Chrome Support Centre scam removal. Uninstall unknown browser extensions and reset Google Chrome to stop redirects to fake tech support website. Here, select Google Chrome Support Centre scam and other malicious plugins and select trash icon to delete these entries. Click Reset to confirm this action and complete Google Chrome Support Centre scam removal. Here, select Extensions and look for Google Chrome Support Centre scam or other suspicious entries. Click on the Uninstall button to get rid each of them. Now you will see a detailed dialog window filled with reset options. All of those options are usually checked, but you can specify which of them you want to reset. Click the Reset button to complete Google Chrome Support Centre scam removal process. ^ Chris Hoffman. PUPs Explained: What is a “Potentially Unwanted Program”?. How-to Geek. The website about technologies. This entry was posted on 2018-05-28 at 07:26 and is filed under Adware, Viruses. You can quickly scan the QR code with your mobile device and have Google Chrome Support Centre scam manual removal instructions right in your pocket. How did you remove Google Chrome Support Centre scam?